Totally natural, completely undetectable custom hair restoration solutions for men.  Introducing Transitions – State of the Art Men’s Hair Restoration Technology for Male Pattern Baldness. 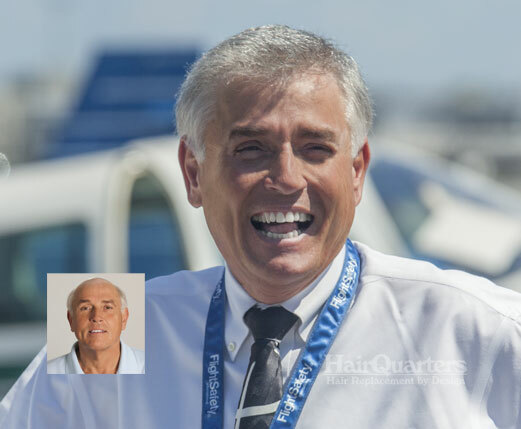 At HairQuarters Hair Replacement Studio in Surfside Beach, South Carolina, we are proud to offer Transitions Hair Replacement for men — the latest in custom state-of-the-art non-surgical hair replacement solutions for men. Designed specifically to meet the individual and unique needs of men suffering from the devastating effects of hair loss, we offer men of all ages the completely natural look and feel of actual growing hair in whatever style and color they desire. The Transitions hair replacement system is virtually undetectable to both sight and touch because your hair graft is made from the best human or synthetic hair available. Your hair replacement will be created to your exact age-appropriate specifications, based upon your desires and expectations, and customized to your individually unique lifestyle. Regardless of your age, there is a Transitions hair replacement solution for your specific type of hair loss. For men suffering from alopecia, male pattern baldness, and other causes of hair loss, our commitment to the highest professional standards allows us to offer totally customized hair replacement solutions. 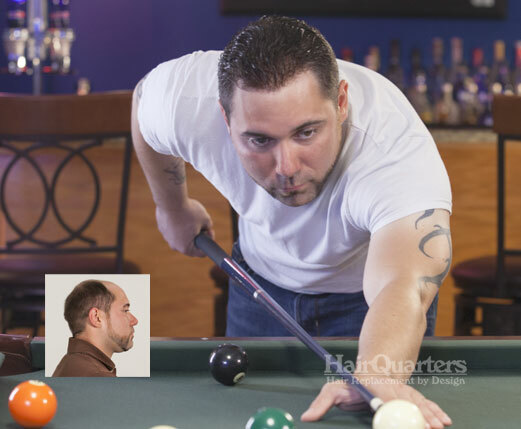 As a member of Transitions International, HairQuarter is the only hair replacement center in the Myrtle Beach, South Carolina area to offer Transitions custom hair replacement systems for men. With a Transitions, your individually customized hair replacement restores your natural appearance as though the hair is growing naturally out of your scalp, with a totally naturally looking hairline, and a completely natural feel to the touch. And best of all, you can have the same total coverage of your scalp as you had before you started going bald. No one will ever know that it’s not your hair growing out of your own scalp. 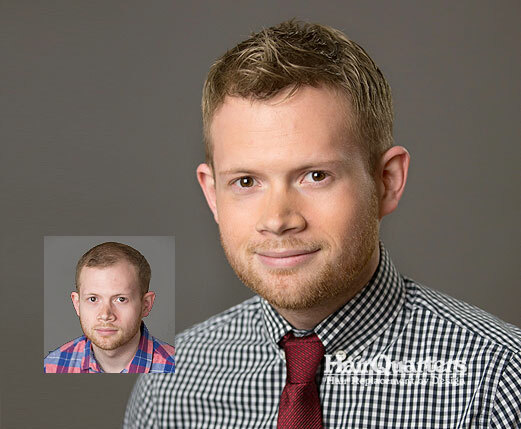 Just look at these actual unretouched photos of the amazing Transitions front hairline. You can create any hairstyle you wish, including those that are combed back in such a way as to totally expose the front hairline. Get the Hair You Deserve. We invite you to schedule your free, confidential hair loss replacement consultation today. Meet with a trained HairQuarters hair restoration professional at our state-of-the-art hair replacement center in Surfside Beach, South Carolina and get all your questions answered privately and confidentially. There is never a charge or obligation! We will be happy to provide information regarding causes of baldness and options tailored to your specific situation and lifestyle. Each of our procedures is individually designed for your specific needs, lifestyle and budget. Whether you are just starting to experience baldness or are in the most advanced stages of hair loss, we can help with our full spectrum of professional treatment options. At HairQuarters Hair Replacement Center, we constantly strive to give you the freedom to choose what is the absolute best solution for you. We provide our clients with personalized custom solutions that are so incredibly natural that there is simply no reason to suffer from hair loss or baldness any longer. 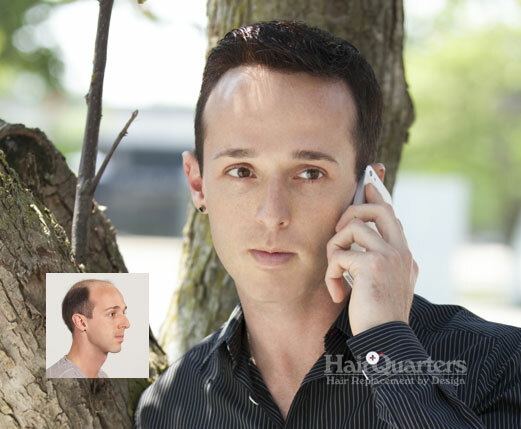 HairQuarters Hair Replacement Center offers FREE and private consultations to help you determine which hair restoration treatment is best for your individual situation. Tired of dealing with hair loss and thinning hair? Schedule your free, confidential hair restoration evaluation today. Our image consultants are also clients so they have truly “been there” themselves. To learn about the solutions available to you, call us today at (843) 238-1089 to request more information or book your free, confidential hair loss consultation online today.